High Elves are not part of the Alliance, so why do Alliance get High Elven tents? If anything, the Alliance should have Kaldorei, Night Elven tents. Considering 90% of Thunder Bluff is basically "tents" this shouldn't be a thing that's missing. Such RP potential! We can finally live as the adventurers we are! The guide says that after completing a handful of quests, we get a scroll (Conciatura di Draenor) that allows us to level up our profession to 700. For our alts that are less than level 90, would we be able to pop by a profession trainer to unlock the WoD tier, or do the toons have to be 90 and do the prerequisite quests? It reminds me of the old Final Fantasy games where you would use a tent to heal when you were far from an inn. The largest horde and alliance tents are nice but not the most efficient use of materials. Check it out bro! I chopped down nine trees to make this tent. Now I'm gonna take a 10 second nap then throw the thing away. Save the planet bro! Having misheard Olivia about the Leatherworking mount, I don't know that I can express my disappointment that we are not going to learn how to make a tanned wolf mount. Check the Orc Male in the viewer. He's got his own style for wearing the helms. Does anyone know how long the tents will last before they fade away? I'd love it to death if they lasted a while for roleplaying purposes, but at the same time.. All I can envision is people cramming these all over the place for spammy griefer purposes hahah! "If you select the Tannery without having Leatherworking, an NPC can craft Draenor Leatherworking recipes for you." Does this mean, the npc can build everything and leatherworking is useless? We are already capable of making 36 slot bags for inscription, mining and leatherworking, are those going to disappear or are there more slots in the future bags. so for professions, we can FINALLY create a whole outfit of gear to wear, instead of only 2 peices, but we are only allowed to wear 3 items max. FFS, whats the point in professions now? High elven alliance tents... I try to keep abreast of happenings... but it is interesting to me (not having read reasons other than those obvious). can we re-use the tent ? or is it gone after we used it the first time? Can we re-use the tent ? or is it gone after we used it the first time ? What I'm not understanding is why you're forced to either level up an herbalist or buy the mats on AH for the most basic LW ingredient (Cuoio Brunito). In order to make it, you have to use Acchiappamosche di Gorgrond. That means if you don't have an herbalist with a high enough skill or level to farm herbs in Draenor, you're forced to buy them on AH. Which means people, being the greedy little insects that they are, will jack up the prices knowing that leatherworkers don't have a choice if they want to level up LW. "But just level up an herbalist." you said? Right. So now I have to do twice the farming for a single profession. I don't mind farming leather, I will happily spend 4-5 hours doing so. I mind having to spend 8-10 hours farming from 2 different professions just to get the mats for a single profession. Does the tent buff persist through death? Also, does it stack with other stat buffs? I'm guessing no, but one can hope. Why (unless I'm just missing them) aren't there green/Uncommon craftable items (for just mats, not things with cooldowns) to help with leveling/gearing alts who are just starting Draenor? Things like Corazza Artica helped my alts and gave me an incentive to level professions more so than getting max level gear. Edit: The "Unique-Equipped: Warlords Crafted (3)" isn't on the rare BoPs for Level 92, 95, and 98, so I'm pretty sure I can answer my own question about whether the item limit applied to those items with "no." I admit to being a bit puzzled about the 36 slot bags. With the new bank tab, there is no reason to haul around huge bags of crafting mats anymore. You drop them all in the bank at your garrison and can craft without ever removing them from the bank. There are going to be a vanishingly small number of people who will want profession specific bags unless I am missing something? So no more leg enhancements huh, was a nice little g cash cow. How this tents works? Are they usable on raids? You have to use one before every boss try? Seems a bit expensive to that. Engineering vs Leatherworking, which one should I take before I boost my hunter? I mostly do PVE and PVP sometimes. The profession bags are completely pointless now, with the 200 reagent stacks. A 36 slot profession bag will hold 7200 reagents, and nothing else. The only gatherers that might benefit from the profession bags are bots that gather 24 hours a day..
the system is deeply flawed. If you arrive in draenor without leather working, which is quite likely. And you know nothing about the quest that eventually gives you a mob you kill to get the bag with both the tannery blue prints and draenor leatherworking, there is absolutely no know way of obtaining the tannery rank 1 blue prints at all. There is this bizarre misconception that the dirty note can drop from any mob...it cannot. it drops from the voidwalker boss at the end of a chain quest in embarri village. If you do not have this profession at the time you kill the quest mob, you are quite literally screwed...with no known way to to do anything about it. I always knew the professions where going to be even worse in this expansion, but this is braindead retarded what the developers have done! If you need to buy the draenor leather working plans in stormshield, then it more than reasonable to know you to also buy the tannery blue prints too, since you cannot get them from any drop apart from the voidwalker boss chain quest. Even after picking up leatherworking and going back to hope and kill the elite despite the fact you have already done it, you won't get a thing. There was some theory on waiting until your level 96 to upgrade your townhall to level 2...as far as i know i don't even have a townhall! The Garrsion system is extremely poorly implemented indeed. If you where never invited to the beta, you will have no clue what anything does...how you go about getting stuff for it blah blah. A tutorial would have sufficed, but lazy goits in califailure couldn't even be bothered to do that. Is it once per day, or is it repeatable? 100 Burnished Leather? Are they kidding! Its as bad as Blacksmithing. Once again they are making any meaningful crafting pointless. Its much easier to run Heroics and get better gear a lot easier. Come one week the Raids are released making the crafting gear even more pointless. Lower the crafting mat requirement by 80% and it becomes a viable alternative for alts to fill the gear gaps on the way to the raiding team/LFR. They need to release a lot more transmog gear to make crafting worthwhile - similar to what they did to Blacksmithing briefly at the end of MOP. It is nice to have an alternative method to get recipes for 36 slot profession bags. It means avoiding grinding old content like the Fronte Magmatico or endlessly crafting Pelle Magnifica. I still like to equip a profession bag when out and about as the profession bags also hold other items that aren't crafting reagents. It also means I don't have to keep visiting banks to drop off crafting reagents. I'm sure the demand for these bags has reduced significantly on the AH due to the improvements in stack sizes and the reagent bank tab. But I'm glad these bag recipes have been added. In WoW professions we now buid items that can rival the raid drop items and are far better than the dungeon drop items. They start small and can be made bigger and bigger. They all are created with what is called a <Random Enchantment>. We even craft items to take another roll at the <Random Enchantment> on the gear. The random enchant includes 2 of the secondary stats (giving us a measurable chance or RNG). Items for the Back (cloak), neck, neck, finger(ring), weapon, and shield, have a greater number of possibilities than other armor items, because they can contain the secondary statistics of Bonus Armor and Spirit (fortunately they do not include the combination of both those statistics ;-). All of the items have a name in the form of "<ItemName> of the <RandomEnchantComboName>". If you click on the <RandomEnchantComboName> link, it will take you to a chart with all the possible names and combinations. I wish I could add a picture here. As we see from this graph, the number of possible <Random Enchantments> for most armor items will be 10. So, you have a 1 in 10 (1/10 or 10%) possibility of getting just the mixture of statistics you want. Only weapon types intended for a healing class will have the possibility of Spirit, and only weapon types intended for a tanking class will have Bonus Armor. Weapons intended for both, will have the same chances as all the jewelry, cloaks, and shields. So if it can be enchanted (by enchanting) or is a shield, it fits in this class of item. So your chances of getting the perfect necklace with just the right two secondary statistics is 1 in 20 (1/20 or 5%). I am not certain whether Bonus Armor and Spirit have the same chance of being included. If they are given a single chance and then chosen between the two, then your chance for an item with perfect statistics not including Bonus Armor or Spirit would be 1 in 15 (1/15 or 6.67%). 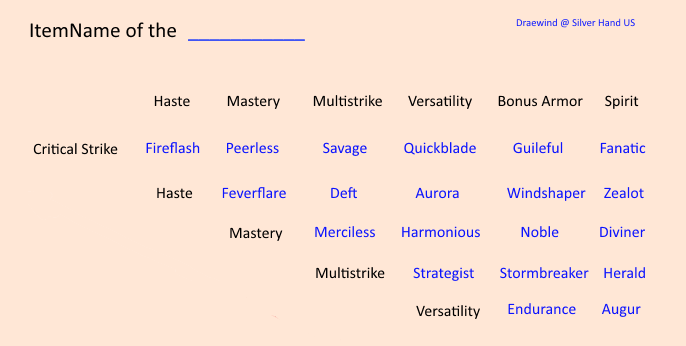 I would list here all the values associated with the <Random Enchantments>, however they vary depending on the slot and material. They also vary with the level of the individual wearing or looking at them. There you have it. All the possible names and combinations. All items of the same level contain the same amount of statistic, such as "54 Critical Strike" and I have not seen a crafted item with a double a statistic (only one statistic but twice the value). EDIT: None of content, just spelling and highlighting. i am max skill at leatherworking (700) but when i make burnished leather it still produced 4 a day. do i miss something here ? The buff from the tents does NOT work in raids. For those wondering: when the item is made, it assigns the primary stat based on your current spec. Example, if you are a destro lock the primary stat will be Intellect, however, that is not the bound stat until equipped. You'll notice a greyed out alternate primary stat on the item description(Agility in the case of a mail piece). So if you mail it(or sell it) to a mail wearer, Agility will become the active primary stat when they mouse over it. That will not become permanent until the item is equipped and subsequently soulbound. So if you're making it for an alt or a friend, don't panic when you see the primary stat for YOUR spec, it will change when traded/mailed to them. At the end of the guide in the 6.1 updates it says, and has a link to, the lv3 Gem Boutique as a requirement for the leather worker follower missions. The Elven tents are NOT faction specific, kind of misleading. The hardest part is that the craftable wearable items REQUIRES Leatherworking to use it! So my leather Rogue only needs one recipe: Leather vest or helm as I crafted two daggers. Only three Warlords crafted items at a time so ALL the other recipes are useless as what leather worker in their right mind would BUY a Warlord crafted item? Then there is the Savage blood which hampers upgrades. Sooo. making bags is about the only thing I can do with my leatherworker besides companions, etc. How many secrets of leatherworking are necessary to buy all the recipes? The number of leather is nice, but it's easier to remember 'I need to make X books' than "Now I'm down to Y leather..."
Wish there were more on the tents here, seems like the best place for it, compared to one of the 20(?) individual tent pages ... I am pretty sure their buff is only +10% stats (despite it being called Well-Rested, there is no accompanying exp boost like you get from being well rested in the conventional sense, which is very confusing and makes me wonder why they didn't just call it something else). As far as I can tell, you can't just sit in some random tent and get the buff, nor can you throw a tent down for randoms to grab the buff. If you are in a raid group or party with whoever made the tent, then maybe it'd work? But i don't know. All i know is I can put a tent down, sit in it, and get buffed, where I get no benefit from sitting in tents randoms have built. Such a frustrating aspect of this game is that so much isn't intuitive at all, and so much stuff is neither intuitive nor easily figured out after months of playing and hours and hours of reading. It makes me wonder why they don't just start actually explaining how things work in tooltips, like if you can dedicate however much resources to making these tents (just as an example) the literally 10 minutes it'd take to have someone write a descriptive tooltip is nothing... It is like you either have to let the game consume your life, or you literally never know what is going on with anything. In the Garrison Building: Leatherworking section, you mention the L3 Gem Boutique, when I'm sure you meant to mention the L3 Tannery. But to confirm there are no daily tannery quests after upgrading to level 3. Is it possible to buy the tents from a LW follower in another person's garrison? I have a friend who wanted to come to mine and pick some up for herself, but it wouldn't let her get any. Not sure if it's a bug or intended. It appears that all tents are available for crafting now, but I did not look all that carefully at the list the last time I bought them pre-patch. Should I be spending Primal Spirit on Burnished Leather, Sorcerous materials, or something else? I have over 200 Primals so I'm not sure what is the best option. Note: I would like to craft Savage Burnished Essences because that are really expensive in the AH. Any advice? Read the first couple parts and I now I don't even know where am I. Why is this always so complicated? 3. Craft <this> from <recipe> that is bought\looted from <location>. That's it! And all this mumbo-jumbo is for Advanced Guide. Make 324 Drums of Fury (each gives 2 points until 650). Takes about 20 minutes and cost me about 3.5k gold. Worth it to save hours and hours of farming IMO. Do you learn 700 item recipes & then upgrade the recipe or is it the item you make that a leather worker can then upgrade. Can other people upgrade it with something you give them. Basically How do I make 715 items for people?